ELIVERN is dedicate to bring the highest standard and efficiency to customer. The brand always strives to be proactive and ahead in product research and development, certifications and qualifications. And we will try our best to achieve your satisfaction! 1.Loosen the screws in the saddle bracket with the Allen key. 2.Clamp the bracket onto the saddle rail. 3.Align the screw hole, using the Allen key to tighten the bracket. 4.Slide light forward onto bracket until it clicks into place. 5.Press down release lever to remove. 6.Twist the light body to adjust the vertical angle. Highest standard in the market. We promise 1-year free duty replacement or refund if any quality problem arises. Also, if you have any questions about products, please contact us. Our E-mail address:elivernsuport@gmail.com. 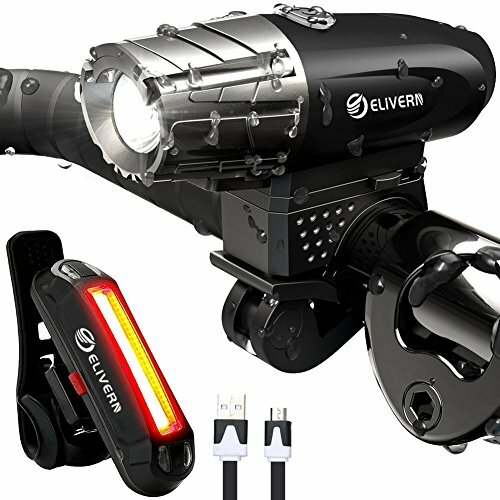 ✅[Professional Equipment]: The headlight can rotate by 360 degrees to light up any directions and light up a distance of 30-50 meters to provide you a safe night cycling. The taillight can be installed horizontally or vertically and can rotate by 180 degrees. Top-tier equipment for your cycling activities. ✅[Multi-Purpose Headlight]: Remove the headlight from the mounting bracket of the bicycle with pressing the switch as an emergency flashlight. Use it when you are walking your dog, running, hiking, camping, cycling, changing a tire, power outage and more. ✅[4 Modes for Headlight, 6 Modes for Taillight]: High Power/Medium Power/Low Power/Strobe Flashing modes for headlight to provide reliable security and safety. High Power/Medium Power/Low Power/50% Flashing/100% Flashing/Strobe Flashing modes for the taillight. ✅[USB Rechargeable, Long Working Time]: Both the headlight and taillight are USB rechargeable. It only takes 2 hours to be fully charged when connected to any device with a USB port. After fully charged the headlight can continuously work 3-7 hours and the tail light can last up to 6 hours. ✅[1 Year Warranty]: Meet the RoHS,CE,FCC and UL standard. We promise 1-year free duty replacement or refund if any quality problem arises. If you have any questions about this product by Elivern, contact us by completing and submitting the form below. If you are looking for a specif part number, please include it with your message.